NEW YORK – Speakers at a side event to the United Nations General Assembly last week commended a new report on access to medicines prepared by a high-level panel hand-chosen by the UN secretary general as containing fresh ideas and the potential to bring change to a longstanding problem. 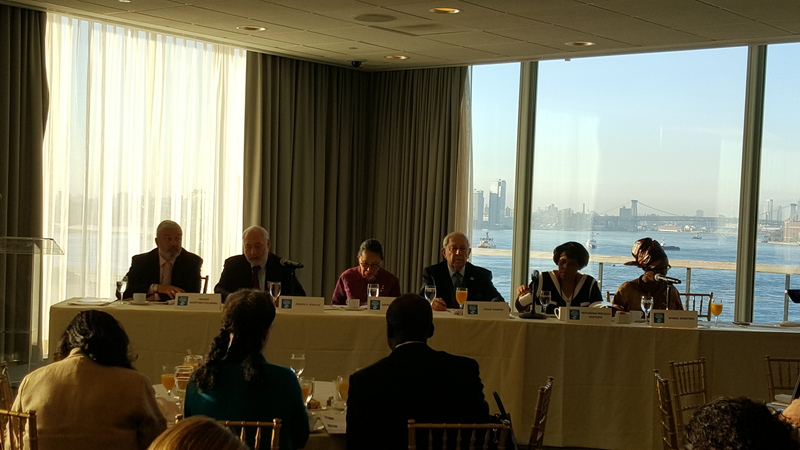 The breakfast dialogue, entitled, The Role of Health Technology: Innovation & Access in the 2030 Agenda for Sustainable Development, was organised on 23 September by the UN Secretary General’s High-Level Panel on Access to Medicines, whose report was released last week (IPW, United Nations, 14 September 2016). The event was about the bigger picture questions of ensuring everyone gets access to the latest health technologies even if they can’t afford it, as “health takes a central place in human development,” and one of the key commitments under the SDGs, as the moderator put it. For instance, the report documents how 11 out of 12 cancer medicines in the United States cost over US$100,000 per patient per year, and for rare diseases, it can be several hundred thousand dollars per year, “placing an egregious burden” on patients, he said. And there are some diseases for which the market-based model has not delivered at all, he added, such as the looming crisis in antibiotic resistance or multi-drug resistant tuberculosis and malaria. “We need to incentivize innovation” for such diseases, said the moderator. But the event took a turn toward the end when the United States became strongly outspoken from the audience in its opposition to the report and its findings. The United States is the only country that appears to be threatened by the report. The report suggests alternatives to the current situation where the world’s poorest and now even many in developed countries are unable to access medicines, in part due to high prices brought on by lack of competition and patent rights. The US issued a statement condemning the report, calling it flawed and too narrow for insufficiently addressing other impediments to access, and strongly reacting to what it sees as a challenge to the intellectual property system and innovation. These views were restated by the US representative in the audience of the side event, which in turn drew a strong response from panellists and others in the audience. In his remarks, Stiglitz commended the report, saying it addresses issues percolating beneath the surface. He said the United States has been “trying to renege” on international law to which it agreed. “You sign an agreement and then you effectively try and undermine that agreement,” he said. The report addresses such issues, he said, making it more difficult for advanced countries to use pressure on countries not to take advantage of the flexibilities built in to international law. The report may not go far enough, said Stiglitz, as it could mention automatic licences, or changing the burden of proof of what you need to do to get a licence, to make it more difficult for developed countries to use their power to pressure developing countries. The report recommendations explicitly talk about pressure on such countries, which Stiglitz said he has “seen again and again” around the world. Referring to the US statement, Stiglitz said he was “astonished” at the US statement, and that the US “clearly” had not read the report if it said it is not enough about innovation, as “the whole thrust of the report is about innovation.” It was clear, Stiglitz said, that the US statement was written by a lobbyist, which he said is understandable as the government is “understaffed and [they] don’t have time to do their own writing.” But, he said, “it was a little bit of an embarrassment from our government that they should have had such a one-sided” view. Stiglitz particularly took aim at recent trade agreements, as he said he is troubled that they do an “end-run around” of the public discussion of finding the right balance between protection as an incentive for innovation, and distribution of the benefits of that. “They are trying to use trade agreements to get a more favourable agreement for big pharma than they could if they had an open discussion with each of our countries,” he said, which can upset the “delicate balance” reached through the political process. And with this issue, the government is always going to be budgetarily involved in a big way, he said, as the public is going to bear a large burden of the cost of drugs. So when the costs go “sky-high” through monopoly rents, the cost is “borne by the average taxpayer,” he said. And to go further, most of the research done by drug companies is financed by the government, so “the drug companies are living off knowledge that has been publicly produced, then capturing for themselves and making us pay twice,” Stiglitz said. Then this creates a distortion in the choice of drugs and the direction of research. Profits are not a good guide to where we ought to be doing research, he said. “You have to realise this is not like producing a better tablecloth. This is fundamentally different,” he said. When we pay higher prices or higher taxes, we sacrifice some other need. On innovation, the report talks about alternative arrangements and finds that the current arrangement “actually impedes innovation,” he said. The report suggests ways that promote innovation. Stiglitz said the US had an experiment with the case involving the company Myriad, regarding whether genes can be patented. In this case, he said, hundreds of thousands of people were dying and Myriad had a patent on two genes. The company’s test was inferior to one developed by Yale University, but the company would not let Yale use its test. Because of the inferior test, a woman did die, he said. The Supreme Court ruled that these patents were not valid. And in the elimination of those patents, innovation has increased, said Stiglitz, who worked on the case: Now there are better tests and prices have come down 90 percent. Working on that case one of the most important things he’s ever done, the economist said, referring to the lives they saved. There is a broad consensus among economists, according to Stiglitz, that intellectual property provisions should not be included in trade agreements because they restrict the movement of goods and ideas across borders. Trade agreements are about facilitating the movement of goods. For many years, some people have argued that what is needed is a “TRIPS-minus” agreement, he said, one that eases the ability to use flexibilities in the World Trade Organization Agreement on Trade-Related Aspects of Intellectual Property Rights (TRIPS). But instead governments keep pushing for TRIPS-plus agreements. As to the US violating laws, Stiglitz said when you try to unilaterally decide not to follow the international law, that’s not the rule of law, that’s breaking the rule of law. Most governments cave in to the pressure, he said. But the linkage of profits of monopolists to other actions by governments is “unconscionable.” It is wrong to threaten say, Colombia, not to help them with fighting the drug war if it resists on IP issues, he said. He said senators and congressmen who are making that linkage ought to be brought out in the open, and that there should be a register in order to bring such things out in the open. In another point, Stiglitz said that science changes very rapidly, so it’s hard to write rules now that are current in 25 years. He noted that the number of years of data exclusivity has become a focal point, but said it is hard to see that number will be same in 25 years. Biologics didn’t exist. These trade agreements need to be living agreements. A lot of experts in biologics say it should be zero years, that keeping exclusivity is impeding innovation, he concluded. Finally, Stiglitz said that President Obama and the Office of the US Trade Representative (USTR) differ. USTR seems to working for the drug companies, while Obama was trying to bring costs of healthcare down. He also raised concern about budgetary implications, as longer monopoly power, the higher the price. Less innovative companies want more monopoly profits, he said. But the equation is that the taxpayers pay. The panel was very much aware of the need to find sustainable solutions, said Sakiko Fukuda-Parr. There is recognition of a variety of efforts taking place, public-private partnerships, patent pools, and progress has been seen, with reductions in medicines prices. This is actually “a story of remarkable success,” for some diseases, she said. But it was the result of “incredible effort” on the part of civil society, donor agencies and others. Solutions are case-by-case, disease-by-disease, product-by-product, country-by-country, said Fukuda-Parr, and the panel found this can only be addressed through a more overarching approach. It is needed to eliminate gaps so people get needed medical products and to address health needs not only of today but also tomorrow, she said. The report gives examples of the gaps, including not only low income but also now gaps in access for people with higher incomes, in cases such as cancer and hepatitis C.
“These problems are not going away, so I think what we need is a new approach, a systemic one,” she said. The core of their recommendations is to create new models that create new incentives for innovation, she said, as the current system that fundamentally relies on high prices for R&D is going to leave these gaps because it is not going to areas where there is not profit. That is why there is a need for a system that delinks price from the cost of R&D, she said, something that was agreed in “groundbreaking” language by all United Nations members in last week’s political declaration on antimicrobial resistance. Innovative sources of financing are being used, like airline taxes. But there is a limit to how much taxpayers will be willing to pay more taxes, which is why alternatives need to be explored. But there is a human rights aspect to the issue, said Fukuda-Parr. Governments have obligations on human rights and on economy, making sure it works right. But the commitments for human rights are not talked about very much, and have very weak enforcement mechanisms compared to trade, she said. She highlighted the human right to health and access to medicines. Governments need to take appropriate measures including requiring the ability of citizens to access affordable medicines, she said. The commitments governments make often do not match internal rules. That’s why the Declaration on TRIPS and Public Health was agreed. It is necessary to put in place way for governments to fulfil their obligations to highest level of health for their citizens, she said. “This is an urgent global priority,” the professor said. It is not just something that can be solved at national level, but requires a global solution. And it is not just an issue for developing or developed countries. The report contains a number of “actionable, supportable” recommendations, she said, and not just for governments. For instance, it recommends starting to negotiate a code of principles for medical R&D, to get a sense of priorities, toward a binding convention at a later date. The panel was mindful of immediate actions but also longer term, she said. A binding convention is not something that can be done today, but what can be done is to take much stronger retaliatory measures against violations of TRIPS agreement. Yusuf Hamied said access to affordable medicines and healthcare has been the “mantra of the developing world.” In a side note, he said people may be unaware that 30 percent of drugs consumed in US originate in India. Hamied said the HIV/AIDS medicine access should be extended to other diseases. That affordability factor has been extended to a couple of other diseases already. He said that as a scientist he has never opposed patents. “I have only opposed monopoly,” he said. “I believe in innovation.” But governments are publicly funding research, therefore the public and humankind should benefit, he asserted. He gave an example of nuclear research, where the United States ignored patents, and with the anthrax threat and bird flu (avian influenza) the US was prepared. He said was approached by US government to provide generic versions even though they were under patent in the US. A recent example of the benefits of voluntary licensing is Gilead licensing its drug with Cipla, said Hamied. The price was $84,000 per course in the US, whereas in India it was available at below $300 per course. The same with HIV, where “you all here pay $24,000 per patient per year,” while the price is $100 in South Africa. The divide is “vast,” he said, and the UN report has addressed this, as it says countries should develop their own licence. Hamied said the process should start with proposing a voluntary licence. If not, then ask the innovator for an obligatory licence. If this is denied, then the country could invoke a compulsory licence. In other comments, he noted that poor countries are dependent on international donors, but this is considered as unsustainable. And there are questions about regulatory approvals and quality as well. Pointing to the declaration on antimicrobial resistance, he said the generics companies can do what is needed, as they are “well advanced” in pharmaceutical R&D. But he said if newer antibiotics are developed with public funding then should be made avail on an affordable basis to humankind. We are on the precipice of global healthcare crisis,” declared Hamied, and acceptance of report will go a long way toward addressing this. Malebona Precious Matsoso reviewed the bleak picture of the world in the year 2000, when the UN Millennium Development Goals were adopted, as the cost of antiretrovirals was more than $10,000, “leaving no hope of survival” for most in South Africa. Today, there is still “unfinished business,” she said, as second and third line treatments are still not affordable. And now there is also a problem with tuberculosis resistance, increasing the burden on the healthcare system. The report is an opportunity for response, and introduces a principle of universality so that no one left behind. The report shows the gaps and the need to respond. “Let’s start now, let’s avoid the mistakes of Ebola outbreak,” said Matsoso, adding: There was development and the work stopped. With Zika, nobody is talking about future disability and strained resources in the future in those countries. Yellow fever shortages make no sense. All that is needed is an outbreak in a developed country perhaps and there will be production. This is at the heart of antibiotic resistance discussions. There should be discussion about preservation of some of the products the world has to make sure are affordable and accessible, she said. The current discussions about the high-priced EpiPen in the US just highlights lack of transparency in pricing in the US, she said. It shows why there are recommendations for delinkage of price and cost. There are still innovation gaps, she added, such as paediatric gaps since children are “not small adults,” but need their own formulations. And, “Let’s move on an R&D treaty,” Matsoso said. How Can Authorities Not Know the Real Cost of Medicines? It is needed to require provision of accurate price information, she said. Pricing currently is set on the maximum that a market can bear. Secrecy on patents has chilling effect on generics, she added. The report calls for transparency in patent info, she noted, and said the World Intellectual Property Organization should hold a database on drug patents in all countries. On drug test results, the report recommends all trials irrespective of outcome should be made public, she said, noting that the World Health Organization has website but it is not populated yet. On trade agreements, she said they usually tie governments’ hands from taking health measures, yet they are negotiated in secret. And the report recommends a ban on intellectual property rights in trade agreements, she said, noting that TRIPS already exists, so why should countries have more restrictions. She also noted that any pressure against using flexibilities for pro-health policies is a violation. Byanyima highlighted the recommendation that the secretary-general act swiftly to form a task force for monitoring, and that all sides should implement right away. In the audience discussion, the US delegate said the government is also trying to work on access to medicines, and that “we put our money where our mouth is” by funding the Global Fund for AIDS, Tuberculosis and Malaria, Pepfar and others. She also said that only 20 of the 300 medicines on the WHO Essential Medicines List are under patent, so “we want to know why the other 280 are not available” if not they are not under IP rights. She further repeated that IP rights and trade are “essential to innovation,” and that there is was not a consensus on the report recommendations among member states nor among panellists. The intergovernmental South Centre expressed its support for the report and its recommendations, and encouraged implementation. An Indian delegate called for the report to be discussed as soon as possible. A representative of UNAIDS suggested that the report be brought to a ministers of finance meeting. A representative of Medicins Sans Frontieres (MSF, Doctors Without Borders) said they face a crisis of lack of medicines in the field, and that patients are not going to be discriminated against no matter where they live. She said US position shows a “complete lack of policy coherence” with Obama administration, as many of these recommendation are among those put forward by Obama administration. The moderator blocked ability for a response from the US. The recommendations are not just for the UN, she noted. Some are for governments and governments can start taking the initiative. Hamied recalled that on the Doha Declaration on TRIPS and Public Health, it was voted 40-0. In implementation, the US wanted to remove a reference to “other epidemics” in order limit its scope. So the vote was 40-1. Yet nevertheless, the reference was removed anyway. So the “1” won the vote on that point, he said. Hamied also told a story that on Pepfar, they gave a document to the Bush administration, and it was stated that the price dropping to $300 made an opportunity. The next day a group of pharma industry CEOs showed up to demand President Bush revoke the statement, which he would not. Instead, they said let us put in the head of Pepfar, and the first thing he did was to say all drugs under Pepfar had to be from US companies. It took the generics four years to get their WHO-approved drug into Pepfar. Some two to four million people could have been treated in that time, he said. "UN Panel Report On Access To Medicines Seen As Holding Potential For Change" by Intellectual Property Watch is licensed under a Creative Commons Attribution-NonCommercial-ShareAlike 4.0 International License.